Map of New Brunswick, Nova Scotia and Prince Edward Island (The Maritime Provinces of Canada). 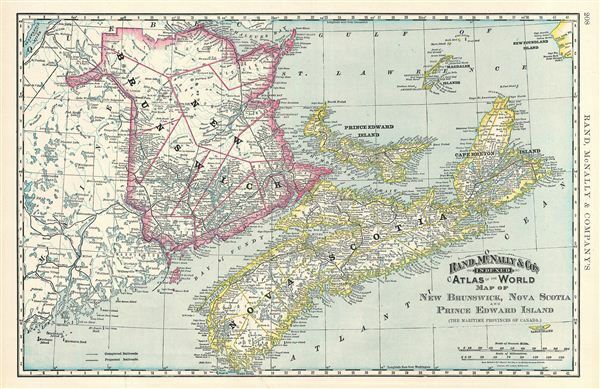 This is a beautiful example of Rand McNally and Company's 1892 map of the Canadian Maritime Provinces of New Brunswick, Nova Scotia and Prince edward Island. It covers all of New Brunswick, Nova Scotia and Prince edward, along with a portion of adjacent Maine and Quebec. Canadian provinces and territories were under British and French control from the 16th century, until France gave up its claims in the Treaty of Paris in 1763. Canada would remain a collection of British colonies until its confederation in 1867, when the British colonies of New Brunswick and Nova Scotia would become Canadian provinces along with Ontario and Quebec. Although known as the 'Birthplace of Confederation,' Prince edward Island would not confederation until 1873. Color coded according to political boundaries, the map notes several towns, cities, rivers, railroads and various other topographical details with relief shown by hachure. This map was issued as plate no. 208 in the 1895 issue of Rand McNally and Company's Indexed Atlas of the World - possibly the finest atlas Rand McNally ever issued. Very good. Text on verso. Verso repair on bottom margin. Rumsey 3565.059 (1897 edition). Philip (atlases) 1026 (1898 edition).